Shop practical and functional everyday accessories and lighting for the home and garden. Offer condition: Delivery charges may apply for orders under £50. Only one promotion code may be used per customer. Garden Trading reserves the right to withdraw this offer at any time. Do not miss another Garden Trading voucher! Simply leave your e-mail address and we'll always keep you informed of new vouchers for Garden Trading. Offer condition: Free delivery over £50. Offer condition: Offer ends midnight 10/12/18. Applies to UK mainland standard delivery only. Offer condition: Offer ends midnight 09.12.2018. Excludes Delivery Charges. Excludes other codes. Offer condition: Offer ends midnight 08/12/18. Excludes delivery and Clearance. Offer condition: Offer ends midnight 05/12/18. Cheapest product will be free. Offer condition: Offer ends midnight 3.12.18. Excludes Delivery. Excludes other codes. Offer condition: Offer ends midnight 02.12.18. Excludes delivery costs. Excludes other codes. Offer condition: Expires midnight 30.11.18. We reserve the right to alter the end date of this promotion. Excludes Clearance products. Excludes other codes. Excludes delivery charges. 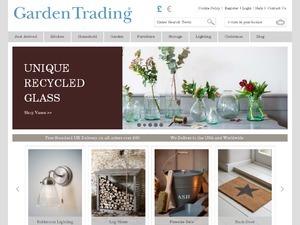 Offer condition: Spend £100 at Garden Trading and you will be given the choice to pick ONE of THREE gifts FREE with your order. While stocks last. We reserve the right to change the free gift. Offer ends midnight 28.11.2018. Offer excludes Clearance. Offer excludes Delivery costs. Offer condition: Save £30 on orders £150 to £299.99. Offer ends midnight 25.11.2018. Excludes delivery costs. Excludes Clearance. Offer condition: Offer only valid on items listed in the Christmas Shop. Offer ends midnight 18.11.2018. Excludes other codes. Excludes Delivery costs. Offer condition: Discount only applies to St Ives Lights when code LIGHT15 is used. Only one code can be used per order. Discount does not apply to delivery charges. Offer expires midnight on 05.02.17. Offer condition: Offer ends midnight 06.11.18. Excludes Delivery. Excludes Clearance. Offer condition: Offer ends midnight 30.10.18. Discount applies to Selected products. Excludes other codes. Excludes Clearance. Excludes Delivery. Offer condition: Offer ends midnight 29.10.18. Excludes Delivery. Excludes Clearance. Offer condition: Valid whilst stocks last or until midnight 13th March 2016. Garden Trading reserves the right to remove the offer at any time. Offer condition: Offer ends midnight 21.10.18. Excludes other codes. Excludes Clearance products. Excludes delivery charges. Offer condition: Offer ends midnight 14.10.18. Excludes other codes. Excludes Clearance products. Excludes delivery charges. Latest voucher code valid at a time of promo publication was entered to be working from 2019-01-21.